On Wednesday, April 29, RAW Artists Minneapolis held EXPOSURE - a showcase celebrating the work of several artists across many mediums - paintings, fashion, music, film, photography, makeup, hair, and performance art. The Pourhouse made a very cool venue because of the different levels and open floor space. RAW is a community of artists that is focused on providing "the tools, resources and exposure needed to inspire and cultivate creativity" for emerging artists. Live models showing off clothing designs, hair, and makeup by featured artists. I scaled the steps to the upper loft space and explored the artists’ wares. Absolutely could not stop staring at the paintings from Contagious Light by Krista Wanous. Further exploration of her website revealed that she was inspired by the lack of color in Minnesota winters and "these female perspectives show the range and variance of feminine emotion and their moments of light and darkness.” That statement gave me chills! Omade jewelry had a great spot near a stairwell and the mah jong tile bracelet caught my eye. I am Filipino and family functions almost always feature grandparents, aunts, and sometimes even my brother playing mah jong for hours. Mah-jong tile bracelet by Omade. One of the live models gave me some closet inspiration. I have a pleather corset and I hadn’t thought to wear it like this, but may try something similar. Live model whose styling gave me some inspiration. I was extremely excited to check out what Lucie of Punkktual would be showing. Punkktual showed at the last season of Voltage/the only season I had ever attended/the first time I had ever been to Minneapolis. The name of her line and the use of leather drew me in. I ended up purchasing this chiffon and leather vest - it’s the perfect layering piece for summer and into fall. 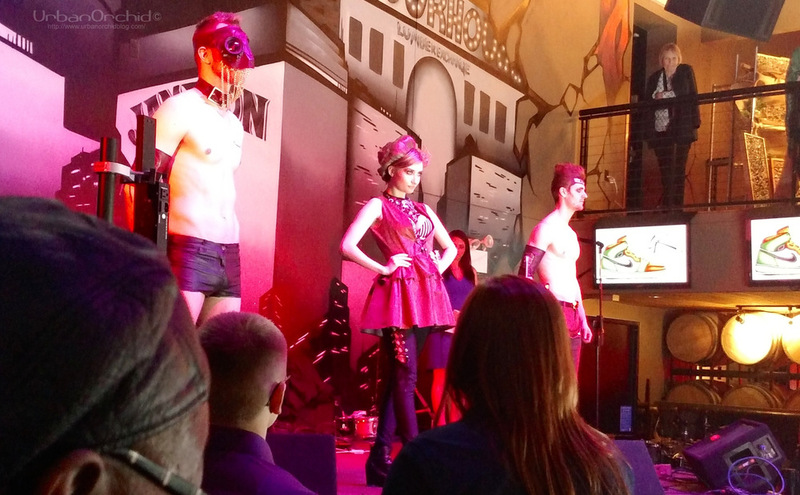 It was also part of the collection she showed at Voltage 2013 (2nd look in the link), also pictured below. The vest I now own walking the runway at Voltage 2013 to Lizzo, Claire De Lune, and Sophia Eris of The Chalice. Performance art at EXPOSURE included Sarah Supernova, who had some fancy hooping tricks with a flaming hula hoop, appropriately set to Ellie Goulding’s “Burn”. As an engineer, you’d think I would hate something called “Form Over Function Designs”, but that is entirely false. Form Over Function is a rock n’ roll musician inspired line that is unisex, so actually I really love it. Leather and studs/hardware are totally my style, and the unisex aspect makes it even more rock n’ roll. I am a fan of androgyny and identify as part of the LGBTQIA community, a clothing line that makes it clear that clothing doesn’t care about gender really speaks to me. Womp-A-Wear had some festival/animal inspired looks. While not my style, it is very creative and reinforces the idea that fashion is wearable art. And damn if some of the hoods don’t look super cozy. Look by Womp-A-Wear. It does look super comfy. Look by Womp-A-Wear. Wish I had a front shot of this, the feathers were really pretty. Chemistry, a Duluth based fashion line, had some looks in the No One Fashion/New American Model segment and is the reason I knew about the show in the first place. It’s always exciting to see Duluth based talent get more exposure (haha, pun intended) in the Twin Cities. The segment featured steampunk looks by the No One Fashion collective - LED fascinators made it clearly modern while still under the Victorian meets sci-fi style. Looks by Anna Peshock inspired by her recent travels abroad closed the show. 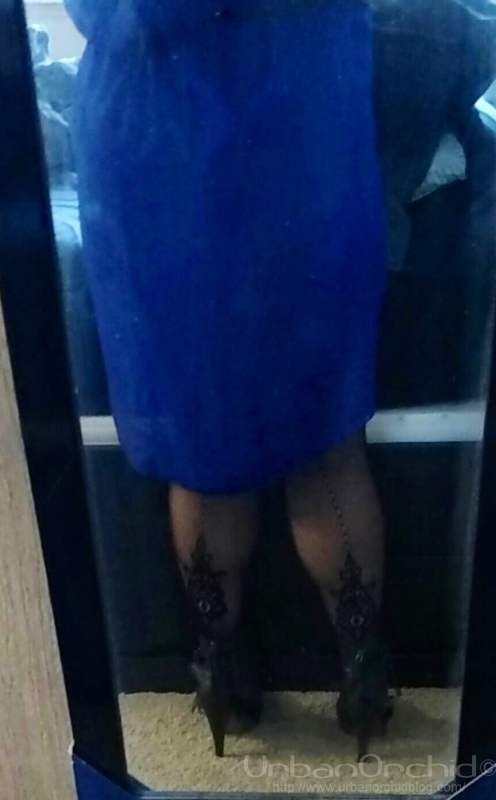 The transitional winter to spring weather was perfect for experimenting with fun hosiery. This dress I picked up at the Duluth Ragstock has become one of my go-to “going out” dresses, and I usually wear it with my Pretty Polly for House of Holland Suspender Tights. Typical pairing for a night out in this dress. This was in November 2014. But I decided to play on the EXPOSURE theme and wore these patterned fishnet suspender tights I bought at Frederick’s instead. What I wore to EXPOSURE. The pattern on the back of the tights match the front. May or may not have been in an Uber to get to a venue 5 blocks away. There were a lot of art mediums represented at this RAW Artists event, but it wasn’t a sensory overload. The leisure to explore the artists booths while live music was happening on the main stage kept it from being overwhelming. RAW Minneapolis is hosting a summer event on June 24 at The Pourhouse, featuring a different mix of artists (some the same, some new, and some very recently established) entitled “SPLENDOR”. Tickets are available here: http://www.rawartists.org/minneapolis/splendor/71329.